Betta fish are in my top 5 freshwater fish. I love them. They’re the perfect blend of beauty, personality, and deathly fighting skills. 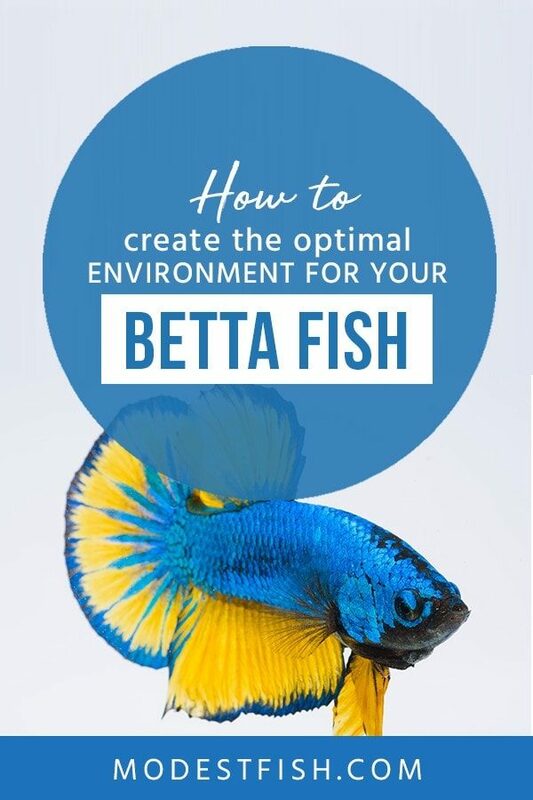 And in this guide, you’ll learn how to provide them with an optimal environment in order to help them thrive and entertain. Bettas in the Wild: Where do They Come From? Bettas (Betta splendens), also called Siamese fighting fish, are native to the Mekong River basin in Southeast Asia. They can be found in Laos, Thailand, Cambodia and Vietnam. Betta fish live in slow moving waters like swamps, small creeks or even rice paddies. Bettas typically live in what’s called blackwater environments where the water is a dark brown color. The dark water in blackwater environments is caused by millions of leaves falling into waterways. As the leaves break down, they release tannins (tannic acid). The tannins dye the water dark brown, just like when you add hot water to a tea bag. The tannins also have a big effect on the water parameters in these environments. All that tannic acid means that the water is always fairly acidic, sometimes pH can even drop below 5. The waterways in this area are also considered to be soft or very soft, meaning they have low levels of calcium and magnesium dissolved in the water column. If you saw a wild betta, you might not even know it was the same species of fish as the one found in pet stores. Wild bettas have small rounded fins and are a drab greenish brown color. All the spectacular colors and giant fins we’re used to come from many generations of selective breeding. The somewhat boring colors of the wild fish helps them to blend into their environment and avoid predators. Bettas are part of the suborder Anabantoidei, commonly known as labyrinth fish. This suborder includes other gourami species like dwarf gouramis, paradise fish and pearl gouramis. All Anabantoidei have a specialized organ that works like a crude lung, the labyrinth organ. Since they live in oxygen poor environments, they can go to the surface and gulp bubbles of air to breathe using their labyrinth organs. The labyrinth organ also helps betta fish when they’re in serious trouble. It’s common for wild bettas to end up in small bodies of water that dry up. They can jump out of the water and survive flopping along the ground for short distances to find a new home when needed. Don’t be fooled by seeing betta fish in cups at the pet store. Bettas need a much bigger permanent home in order to thrive. The absolute minimum tank size for a betta should be 5 gallons. Yes, I know that you see them in stores being kept in tiny little cups. Yes, tiny, quart-size betta tanks are sold in stores. But just because the poor fish can survive being kept this way does not mean it’s the right thing to do. Frankly, I think that the tiny cups and bowls should be illegal because they border on cruelty. Keeping bettas in tiny tanks or bowls means that they are constantly being exposed to ammonia as their waste breaks down. It’s impossible to get a healthy nitrogen cycle going in a small, unfiltered tank. Bettas are really tough and can live for a short time in these conditions. But for them to be happy, healthy and have a normal lifespan, they need more room. Also, their behavior is much more lively in a larger tank. They swim around and investigate things when they have more room. They’ll even come out to greet you when your face gets near the aquarium. In the tiny containers, they just sort of sit there and look pitiful. Believe me, they’re so much more interesting in a bigger aquarium. Bettas need an inert substrate. You can use gravel or sand or smooth glass stones, whatever you prefer. Just avoid aragonite sand. It’s made of calcium carbonate (CaCO3). It will slowly leach both calcium and carbonate into your water, increasing both the general hardness (GH) and carbonate hardness (KH) of the water. It will also increase the pH. Bettas need soft, acidic water. So a substrate that constantly increases GH, KH and pH should be avoided. Just on a personal note, I think that a betta’s colors look nicer against a dark substrate. This is another point that I will get on my high horse about. Betta fish need a filter for their tanks. A filter doesn’t just move water around. It provides a home for beneficial bacteria that process fish waste. It’s a fact, fish constantly pee and poop in the water they swim in. All that waste sinks to the bottom of the tank and starts to break down. This creates ammonia (NH3) that builds up in the water column. Ammonia is really toxic to fish. It chemically burns their gills and the damage done can be permanent. If enough ammonia builds up, the fish will die outright. Luckily, the beneficial bacteria that colonizes aquarium filters processes ammonia into nitrite (NO2 -1) and then nitrate (NO3-). Nitrate is much less toxic than ammonia. So it can be allowed to build up in the tank in between weekly water changes. But, this nifty nitrogen cycle can’t happen in a small stagnant fish bowl. The beneficial bacteria in fish tanks needs oxygen to be able to survive. If there’s no water movement, they can’t set up shop and help process waste for you. So, without a filter, your betta will constantly be exposed to ammonia from its own waste. This will either kill the fish directly or will keep it in a constant state of stress that will make it vulnerable to disease. If you look at all the most common diseases that affect bettas, all of them are linked to poor water quality. If all this isn’t enough to sway you, think about it like this. Just imagine, you’re locked in an elevator with your own waste breaking down around you and putting off toxic substances. Yep, that’s what it’s like in an unfiltered fish tank. So, please, add a filter. You don’t have to break the bank. A simple sponge or internal filter rated for the size of your tank will do just fine. You want a filter that will give a gentle current in the tank since betta fish are not the strongest of swimmers. Bettas don’t really have specific lighting needs, most fish don’t. Lighting our tanks is more about us being able to see the fish, or making the tank look nice, than it is about requirements that the fish may have. Ambient light from the room is more than enough for a betta. So base your lighting on what you want. Or if you have live plants in the tank, which I highly recommend, go with whatever lighting is best for them. Bettas are a tropical species. They absolutely need a heater so that their water stays at a steady 75°-81°F (23.8°-27.2°C). Bettas are notorious jumpers. Some people have even trained their bettas to jump through hoops. In the wild, they will jump from puddle to puddle so they can escape poor water conditions or a pool that is drying up. In aquariums, many betta owners have come home to find their fish on the carpet. So it’s best to have a tight-fitting lid in case your betta decides he’d like to look around the neighborhood for a new house. Make sure that you leave at least a half inch gap between the lid and the surface of the water. That way there’s room for the betta to come up to the surface for a breath. It’s best to add decor that gives your betta a few hiding spots. Sometimes bettas feel shy and need a little cave or recess to retreat to. You might think about adding a betta hammock. They’re little plastic leaves with a suction cup attached. The betta hammock gives them a little perch so they can snooze in the afternoon close to the surface of the water. Put your betta hammock in the calmest spot in the tank so your betta can rest without having to swim against a current. I think it’s really neat to see them lounging around on the hammocks. It makes me want to curl up in my own hammock on a sunny afternoon. Live plants are a great addition to a betta tank. Java fern, anubias and Java moss grow well in small tanks. Floating plants like frogbit or dwarf water lettuce can discourage jumping. Plants will provide hiding and resting spots and help keep your water clean. Make sure that there are no rough or jagged edges on your decor. These can snag a betta’s fins as it swims by and cause ragged or torn fins. I’ve seen cases where it seemed like a betta had fin rot, but it turned out that he was just catching his fins on rocks or decorations in the aquarium. OK so these are not an absolute necessity. But, I really can’t recommend them highly enough. They are a great way to help mimic the natural habitat for betta fish. Indian almond leaves come from the Terminalia catappa tree, native to tropical regions in Asia. In Southeast Asia, where most bettas are bred, Indian almond leaf is pretty much universally used as a water conditioner. It is also usually the only treatment used for dealing with sick fish suffering from injuries and/or bacterial infections. Indian almond leaves leach helpful compounds like tannins, flavonoids and punicalagins which have anti-microbial, anti-inflammatory and antioxidant properties. These compounds can also help absorb some minerals from the water and lower the pH, making the water softer and more acidic. Pro Tip: Whole Indian almond leaves are the perfect thing for breeding betta fish. Males will build their bubble nest underneath the floating leaf. As the leaf breaks down, it also provides food for newborn fry. The leaves can be left whole or cut into pieces and floated in the tank. They’ll sink after a few days. They break down completely after about a month, leaving only the stem and leaf veins behind. You can just remove the stem and replace with new leaves. The potency of the leaves can vary, so one leaf for every 2 gallons is a good starting point. Pro Tip: Tannins in the leaves will dye your water somewhat. But the benefits greatly outweigh dealing with tinted water. You can take out leaves and do a water change if the water gets too dark for your taste. 1. Place Indian almond leaves in a clean quart jar or other container that can handle boiling water. 2. Boil water on the stove. 3. Pour water over the leaves to fill the jar. Be careful! 4. Let the jar sit uncovered and cool completely. 5. After cooling, remove the leaves. The water should be dark brown. How much to use each week is unfortunately not an exact science. Commercially prepared extracts recommend using one teaspoon per 2 gallons. Just to be safe, I’d start with half a teaspoon per 2 gallons and increase from there if desired. In the wild, betta fish are insectivores, meaning that they eat insects that land on the water’s surface or larvae swimming in the water column. In the aquarium, it’s best to feed them a diet high in animal protein but also add in some fiber to promote healthy digestion. Pro Tip: Feeding prepared pellets is a good idea because it also provides fiber that betta fish need. These little guys can get constipated and very sick without a source of fiber. Betta fish have tiny stomachs. I mean, really tiny. They’re only about the size of the fish’s eye. So it’s better to feed them two small meals a day, split between morning and evening. Even if they beg for more, don’t give in. Feeding them huge meals can lead to constipation. Some bettas die from not being able to pass their waste. So take this seriously. Overfeeding betta fish is really easy. For other species, I’d say don’t feed them any more than they can eat in 30 seconds. That’s my normal advice for anyone asking how much to feed their fish. But this rule doesn’t work for bettas because they are really slow eaters. So for these guys, I’d change it to only feeding them as much as they’ll eat in three minutes or so. Make sure to remove any uneaten food immediately. Uneaten food quickly starts to break down and can really foul your water. Tank mates for betta fish can be a difficult subject to approach. Because there are no guarantees when it comes to tank mates here. Anyway, here are some guidelines you can follow. You cannot keep more than one male betta in the same tank. They will fight until one or both of them is dead. Males can also beat up on females when they’re not spawning, even killing them sometimes. Just expect that a male cannot be housed with any other bettas. You can keep several female bettas in something like a 10 gallon or larger. It’s better to have a group of three or more so any aggression gets spread out. 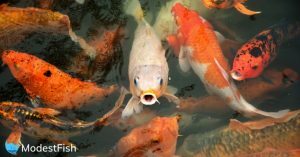 They will establish a pecking order and should be OK.
Keep an eye on them and remove any fish that seems to be overly stressed. You don’t have to keep your betta all alone. There are some species that generally do well with bettas. Pro Tip: Please remember, your betta will not get lonely. It doesn’t need tank mates. Always remember it’s you who wants to provide the friends. Be very careful when it comes to adding any species in with a betta. There are no guarantees. Besides other bettas, you should avoid species that look similar or fast-swimming species that may nip the bettas fins. Bettas have been known to attack male fancy guppies because of their bright colors and large tails. Bettas cannot be mixed with certain species of gouramis. Especially really colorful species like dwarf gouramis or paradise fish. Male gouramis and bettas may mistake each other for the same species and start fighting nonstop. You can try to mix more peaceful gourami species, like pearl or blue spotted, but you should keep a close watch for aggression in the tank and be prepared to separate them. 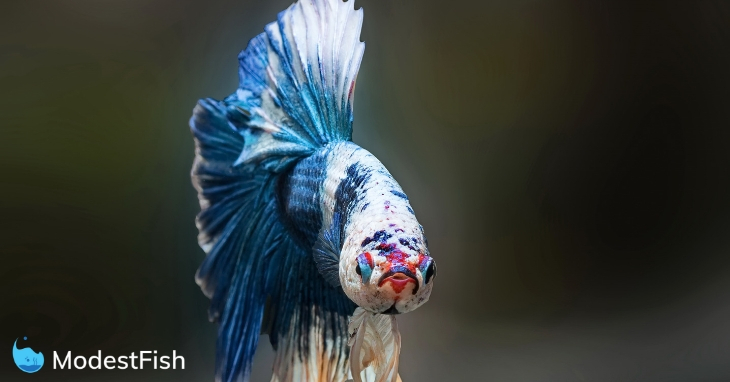 Bettas can and do get picked on by more aggressive fish. They are not fast swimmers and can’t get away from speedy fish. 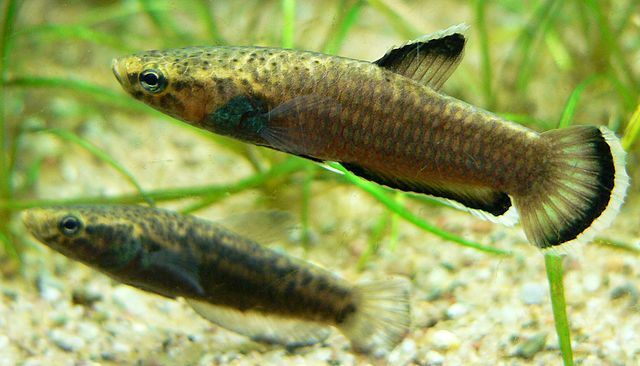 You should not try to mix them with bigger fish like most cichlids or aggressive/semi-aggressive fish like tiger barbs. Any fish listed as a “fin nipper” is a no go. A lot of people pick up bettas on a whim thinking that they’re super easy to take care of. And they are, but they still need to be provided with a proper environment and care. They are a living thing, not a decoration to be stuck in a vase on the kitchen counter. They need a big enough tank, filtration and a heater to live happy, healthy lives. Not the jars and vases depicted by a lot of outlets. If you can’t provide these things, then maybe getting a betta fish isn’t right for you. If you’re thinking about adding a betta to your existing community tank, make sure that it’s going to be compatible with your other fish. You have to worry about the betta being aggressive with some species and you also have to make sure the betta isn’t going to constantly get beat up either. Adding in a betta with tank mates can be hit or miss. Some individuals will happily live a peaceful life with all kinds of other fish. Others may be homicidal maniacs, bent on utter destruction of anything else that swims. There’s no way to tell for sure which kind of betta you’re bringing home from the store. So be prepared to separate the betta to its own aquarium if things go south in the community tank. 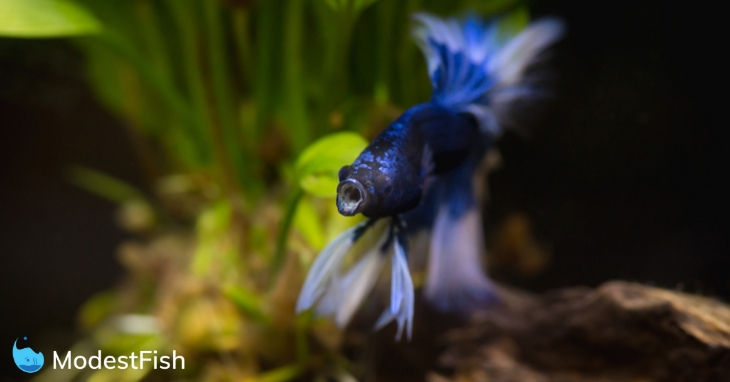 Is a Betta Right for You? Betta fish really do make great pets. They’re one of my all-time favorites. They’re beautiful, and given the right conditions, they have great personalities that are really interesting. I love how they come out to greet you when you get near the aquarium and a healthy male in full regalia is just stunning. Bettas are hardy little fish, but they still need the same level of care as other species. That means a proper tank, healthy food and regular water changes. I think that bettas are one of the most mistreated types of fish in the entire aquarium trade. I don’t think people set out to treat them poorly, but they’re misled by seeing betta fish kept in cups or the tiny betta tanks for sale on the shelves. I will preach from the mountaintops, or more likely the fish aisle in my local pet store, that these wonderful fish deserve better treatment. Bettas are gorgeous little spitfires, and with proper care, you can enjoy them for years. I highly recommend them for beginners and seasoned pros alike.